U.S. dollar credit cards can sometimes be confused with foreign transaction credit cards, but they aren’t the same at all. Foreign transaction credit cards save you on currency conversion fees, while U.S. dollar credit cards never convert currency at all, keeping your currency in U.S. funds and avoiding conversion fees altogether. That being said, they only make sense if you have a USD bank account with a balance you can use to pay off your U.S. card. Otherwise, you’re going to have to convert your Canadian dollars to USD first to pay off your USD credit card. Doing that is likely more expensive than just letting your CAD credit card do the conversion for you. receive income in U.S. funds. If one or more of these things are true for you, consider picking up one of these U.S. dollar credit cards because it could really save you in the long run. 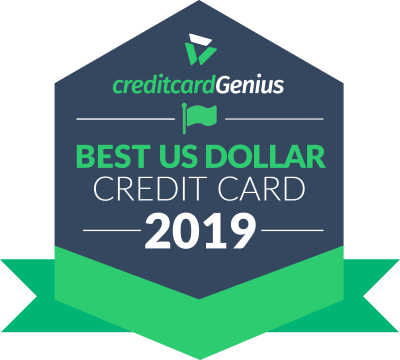 Review all top 10 U.S. Dollar credit cards here. Our top spot for the best U.S. dollar credit card goes to the . While most U.S. dollar credit cards don’t have many frills or benefits, this card definitely sets itself apart by also giving its cardholders 1 point for every $1 spent. For a $65 (USD) annual fee, it also comes with a comprehensive suite of travel and purchase insurance. For a $35 annual fee, the is another top card to consider when thinking about getting a U.S. dollar credit card. What's cool about this card is your annual fee is waived for each year that you purchase $1,000 USD or more in a year. It also comes with Extended Warranty and Purchase Protection insurance.